The Enviroscape model provides a hands-on, interactive demonstration of the sources and effects of water pollution, and allows teachers to demonstrate ways to prevent it. 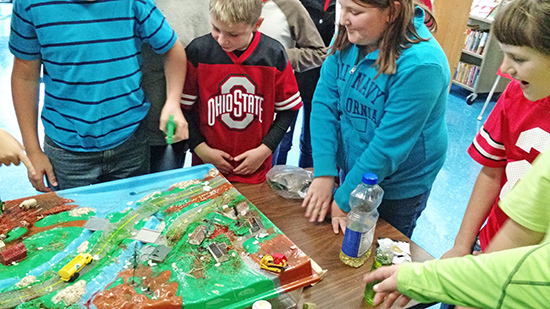 GROVER HILL – Recently, fifth grade students in Kathy Sinn’s class at Grover Hill Elementary learned how everyone plays their part in contributing to the pollution plaguing our creeks, streams, rivers, and eventually Lake Erie. Students were able to visually see how everyone plays a part in pollution via the Enviroscape model. To understand how water pollution occurs and moves through the environment, students reviewed knowledge on the water cycle and learned about watersheds. The water cycle consists of water moving through the environment in four basic stages of precipitation (rain, snow), collection (falling into lakes, rivers), evaporation (liquid to gas), and condensation (gas to liquid). Students then learned about watersheds and how they are important to understand in pollution. A watershed is an area of land whose water drains to a common body of water and includes all the rivers, creeks, and lakes in that area as well as all the soil, air, and groundwater within its boundaries. Humans have altered the water cycle by paving over the ground surface in our towns and cities. A major issue is created as water cannot penetrate the pavement and leads to runoff. When that water moves over the surface it also carries pollutants with it such as motor oil, fertilizer, pesticide, soil, road salt, carwash soap. Things we don’t want to see in our streams that we rely on for our water. This pollution goes into storm drains which commonly do not go to the water treatment plant during a large rainstorm. On the other hand, stormwater in the country can soak into the ground in most cases and is filtered by plants growing in the area. Pollution can come as either point or non-point pollution. In point pollution, there is utmost certainty where the pollution is generated and might include a factory drain pipe or a sewage ditch. Things get trickier with non-point pollution because we cannot pinpoint the source of the pollution. It could come from a wide variety of areas such as farm fields, home lawns, construction sites, factories, or even roadways. It comes from all these sources and not one source. To demonstrate how every individual in a community plays a part in pollution, students observed the Enviroscape model. In this model, there is a factory, construction site, residential area, roadways, and farm fields along with a river that leads to a lake. The first pollutant introduced was manure (chocolate sprinkles) which went on the residential areas for those who have pets, around the lake for animals who live there, and the farmer’s field. Other pollutants included road salt (powdered soap), litter (paper), fertilizer/pesticides (different colors of Kool-Aid), soil (cocoa powder), motor oil (vegetable oil), carwash soap (dish soap), and grass clippings. Once all the pollutants were spread in all the areas that utilize these items, a big rainstorm came along. As the rainstorm intensified, students could see their environment become very polluted and dirty very quickly as all the pollution washed off the landscape into the river and eventually the lake. Students could see how even the homes far away from the lake contributed to the polluted lake. Overall, everyone has a role to maintain the health of our local waterways. All the individual sources of pollution add up to a larger problem by the time it gets to our lakes as we saw with Lake Erie near Toledo. Pollution can be avoided in many ways. We can wash our cars on the lawn to prevent the harmful phosphate soaps from reaching streams, plant cover crops to reduce soil erosion by holding the soil in place, or checking our cars to see if there are any gas or oil leaks. Every little bit helps to keep our waterways clean to drink, fish, and swim in. If you would like this program for your group, call Patrick at the Paulding SWCD at 419-399-4771.